The pope gave a sermon last month which was widely reported. It was timely. The western world was turning its thoughts to the annual winter ritual of overspending and over-eating. No surprise, then, that the resulting headlines all seemed to focus on the ‘charade’ of Christmas. I looked up the sermon but couldn’t see where – or if – Pope Francis used that word. Many other words, though, were worthy of headlines. More worthy. Especially now, as Britain decides whether to support France, our neighbour and ally, in bombing Syria. He had more to say about war and peace, but before we get to that – a glance at Christmas, in passing. I saw some research recently that suggested British families expect to spend, on average, around £800 celebrating Christmas in 2015. And to do so, many families will go into debt – in 2014 the UK topped the European Christmas-induced-debt league table. Fine – if that makes you happy. But I suspect it doesn’t. And that’s just one reason why I’d agree that Christmas is, indeed, a charade. But there’s more to this charade than hopes raised and dashed, than parents plunged into self-inflicted debt and children dissatisfied with even the wildest largesse. I’m afraid there’s much to be miserable about at the moment. The weather is vile. Dank skies and squelching gardens. Pelting rain and roaring winds. Grey flagstones and sodden raincoats. Friends and acquaintances brim-full with sadness, rooted in reasons more serious than mere weather. Libraries closing, children’s centres closing, police stations closing. Cars by the side of the road with handwritten signs buckling in the window: ‘For Sale’. Our economy supposedly growing, but foodbanks busier than ever. More homeless people on our streets. Updates from our local soup kitchen make desperate reading – which young, vulnerable person has died from lack of care lately? Terrorism stalks the world. In Paris, Nigeria, Egypt, Beirut, Tunisia – too many places to list. Waves of refugees are washing up – some half dead, some wholly dead – on the beautiful shores of the Mediterranean. More camp in squalor twenty odd miles across the sea, in France. And our government wants to start bombing Syria. At this point, then, let’s return to what the Pope said. “Everywhere there is war today, there is hatred. What shall remain in the wake of this war …? The situation in the Middle East is far too complicated for a blog post of a few hundred words. But anyone who reads any analysis knows that we’re already playing, as a nation, a complicated cat’s cradle of peace and war. 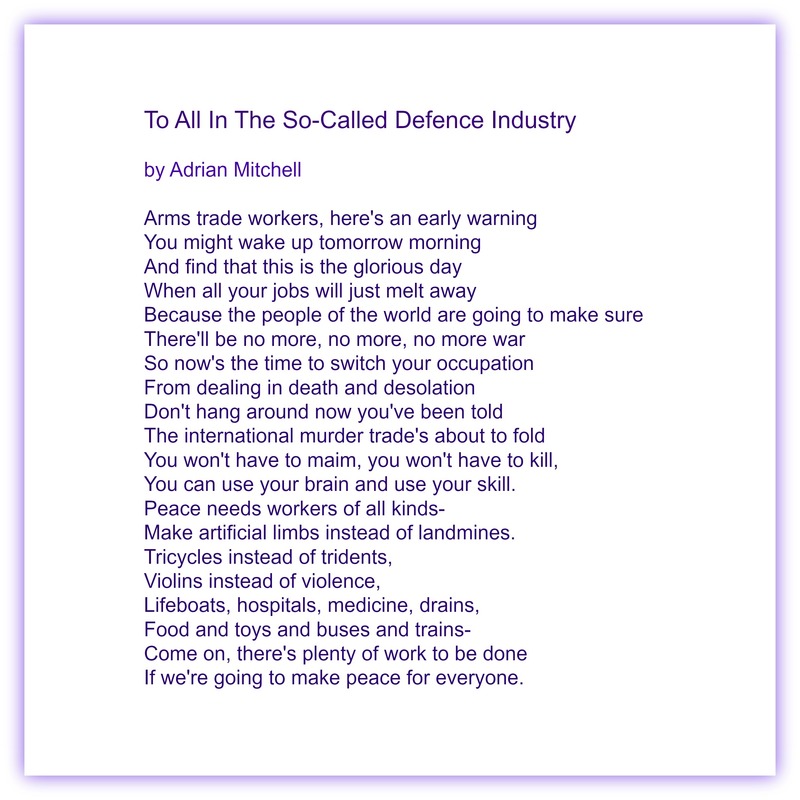 Our arms industries sell to regimes like Saudi Arabia. Saudi Arabian interests fund extremist supposedly-Islamic groups. Our government once wanted to take us to war against the Assad regime in Syria. Now it wants us to go to war with those who would keep it in power. Because ‘we’ want to support our allies in the wake of the Paris atrocities. Surely even a fool can see this is madness? ‘Oops, we accidentally bombed a hospital’, admit our American allies. Dr Lowry fears the same fate awaits Syrian civilians in Isis strongholds. I can’t say that emulating anything that happened during the Vietnam War sounds like a good idea to me. And bombing in Syria and Iraq hasn’t exactly worked so far. Now before you have a go at me about Christianity and war – I know. Christianity has no proud history in warfare. I studied the Crusades as my special subject at university. But we have, I hope, learned our lessons – at least, some of us have. There are, sadly, supposedly-Christian extremists just as there are supposedly-Islamic extremists. I do not believe we should commit further to a ‘war’ that we cannot win, cannot fully understand and whose ‘planned’ outcome seems like the equivalent of sticking a tail on a donkey while blindfold. It’s easy to feel dejected by all the misery stalking the world. It’s tempting to go back to bed and hide under the covers with a good book till it’s all over. Yet I’m sitting at my desk, feeling like there’s hope in the world. I unwrapped a bar of special soap this morning and had a long, hot bath – what a luxury. The soap came all the way from Australia. From a kind and thoughtful person (I know this, despite the fact we’ve never met) who reads my blog and whose blog I read. The uplifting scent of that lemon-myrtle-goat’s-milk- soap changed my mood in an instant. Thank you, Elladee, for brightening my day. Despite everything. This entry was posted in Thinking, or ranting, or both and tagged Adrian Mitchell, Ben Tre city, bombing, Christmas, Dr David Lowry, peace, Pope Francis, refugees, Syria, Vietnam War, War. Bookmark the permalink. This is disturbing. Pope Francis has said things that I don’t want to hear. I choose to keep up the charade. I choose to fake Christmas again. And step by step, the writing of cards and thinking about old friends and family members, greeting people in stores, buying gifts, supporting charities, brings back joy. I would like to be feeling as you feel but the hideous commercial charades at the shops and online commerce sites, the multi-million pound adverts competing for slushy Christmas advert of the year, have repulsed me. Until recently we did not have your Black Friday or Cyber Monday (as we do not celebrate Thanksgiving) and they, on top of ‘Christmas’ festivities starting in late October/early November, all based around spending on things people don’t need and don’t want, things that waste our precious resources … well, it takes the shine off the joy. In the same way foodbanks and soup kitchens and homeless people on the streets spike the joy of being warm and cosy and comfy indoors … But that’s a state of mind and attitude – I’ll think about yours and see if I feel it’s a better one. Genuinely. Unlike you I have no family nearby and perhaps that helps. I am involved with charities that, I’m afraid, only highlight how many people make their joy by sticking their heads in the sand and ignoring the other. But that too is fair. Life is hard enough for many people and mine is relatively easy. As I wrote in my post, here we are (a) living in wind, rain and dark grey skies, (b) depressed and worried about the refugees fleeing war in Syria and terrible economies elsewhere, heading hopefully but probably fruitlessly for our country and others (c) worrying about terrorism (d) praying that our government sees sense about whether to increase involvement in Syria without a proper plan for the ‘settlement’ afterwards. I started this reply earlier and was telling myself to be positive, see things differently and head for the refugee donation centre this morning with a smile on my face (I will), glad because so many people are sympathetic with those who are less well off than they are. I had my shower, got out and the phone rang – my husband had cycled off to the train without his keys. I had to dash out, no time to dress properly, putting a coat on and buttoning it up – and promptly reversed into the gate that had blown shut on one side of our drive thanks to the high winds last night. I’m responsible for the first black gash on our one-year-old white car. I’ve been to visit the man several houses down whose Daily Mail (a Conservative paper) we got this morning. He was lovely. Elderly, with a stained jumper and kind face. He does not have our papers and only 2 houses receive papers from our shop. Our papers have gone astray somewhere else – so there is a shock in store for someone – as we continue to experiment with the communist Morning Star – as well as the independent i.
It’s the lemon myrtle soap moments that warm the soul. It is – that’s exactly right. I don’t think the nations of this world or their leaders or enough of humankind have learned the lessons…that will prevent them perpetuating It and They. I’d love to be able to disagree with you, to point out where you’re wrong. But of course I can’t. And unfortunately I don’t even think the Pope’s message will have an effect. Believers may nod their heads but I think as a society we are too caught in fear of losing a way of life that is only collateral damage to what is really at risk. Our humanity. I hope there is a break in the weather, some bright spots, victories, an authentic festive season (stay away from shopping centres) that while so much might be dismal and unsatisfactory there are other balms as well as friendship and cleanliness to buoy your spirits. Funny that… the weather is beautiful at the moment, if a little warm and I was wishing you were here to enjoy that, if nothing else can be accomplished. No individual can revamp the entire world. But we can shape our own life and environment and seek contentment with that. Such difficult times. More ahead no doubt. Perhaps some day ALL people will decided killing is wrong and ALL will choose to be tolerant of others’ beliefs. If three wishes were given? Let ALL people choose to agree to disagree and still be friends and get along in peace….one wish…I’ll take just one. I wish, too. I don’t think it will come true – but those who keep on trying to make it true will always win if only in their hearts! I have a horrid feeling the thing I wrote about the rats is a pretty accurate reflection of human nature. No escaping violence and aggression. BUT I am now going to wish and HOPE it comes true 🙂 There, that’s two of us!